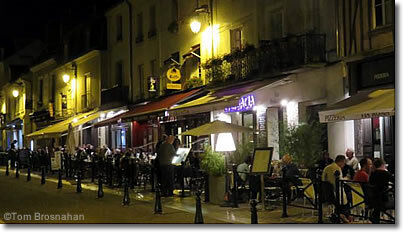 Amboise has a satisfying selection of cafés, patisseries and restaurants. It's a good idea to call ahead and reserve your places anytime, but essential from June through September. 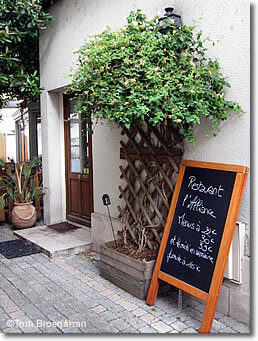 Café-restaurant on Place Michel Debré opposite the Vignobles d'Amboise cave (map), it's among our favorites for food and service. In the very center of the town by the church where the waterfront meets rue François Premier (map), this large, bustling restaurant, formerly called the Brasserie de l'Hôtel de Ville, has a varied menu of standard items good for an uncomplicated lunch at a decent price. The most prominent location in Amboise—at the foot of the ramp leading to the château (map)—makes this good café-restaurant perfect for people-watching with a drink and a light meal. 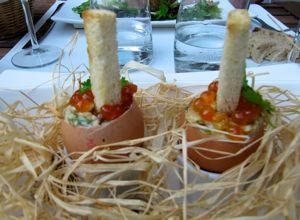 A dozen restaurants on Place Michel Debré: good choice! As in "cocktail shaker," this café-bar facing the château from the Île d'Or, the island in the Loire, exists for its drinks and its sunset views of the château. Have reservations, or claim a table long before sunset. Closed Monday off-season (September to May).